Author's Note: As always, these articles are created with the best information that I have available at the time. Should you find factual inaccuracies, please email me at feedback@michaelwhitehouse.org and I will work to correct the article to be more accurate. As an additional note, the purpose of this article to discuss a specific alternate way that events could have gone which would have resulted in a more desirable outcome for all involved. This article is not intended to discuss whether or not people were right to attack Jeff Mach and his company, nor is it discussing the allegations at all. It is discussing what actually happened and the results thereof. Other articles may address those other issues. I woke up quite rested this morning for the first time in a long time. I woke up at 6:00 AM, but I fell asleep at 9:00 PM. That's the key to a good sleep: not waking up late, but getting an early start. Like sleep, the outcome of many things comes out of how it began. For those who are not familiar with the company, Jeff Mach Events was a company that ran geek events primarily in the New Jersey area. Their main events were Wicked Faire (a general geek festival), Steampunk Worlds Fair (the largest Steampunk event in North America), and Geeky Kink Event (an event which is accurately described by its name). In all, they ran 7-10 events per year of various types. On March 13th, I had the unpleasant duty of announcing to the Steampunk community that Silver Phoenix Society would be stepping away from running Steampunk Worlds Fair and that, as a consequence, the event would likely either not happen or not happen as they expected. But to really understand what happened on March 13th, let's rewind two months to mid January. At the time, Amy and I were rank and file department heads. In fact, until I was invited to a department head meeting, I didn't even know that we warranted the title. We ran the Info Desk, sold merch, and ran ConCardia at the events. We didn't talk to a lot of the other staff between events. I spoke to Jeff as much as I needed to for my role. Amy was hired to be his "assistant", but that mostly just meant some simple office work like assembling rooming lists and updating the social media Buffer feeds. It seemed like just another week, but what we did not know was that the house was full of gas just waiting for a spark to ignite it. That spark, as it turned out, was a post from Jeff Mach seeking new staff and volunteers. Jeff's detractors seized on this, screen-shotted the Facebook post and placed a caption on it warning that no one should work for that company because it mistreated people. From these small pebbles the avalanche began. I became aware of this on January 23rd when I first started seeing the posts. The posts were on the pages of former staffers who had previously and publicly declared their desire to see Jeff Mach and his company destroyed, so I perceived this to be nothing more than an attack by those who had promised to do so, but it was much more complex that that. The best way to give a good understanding of what happened is to discuss what should have happened. I have spent a lot of time pondering how this could have turned out right. 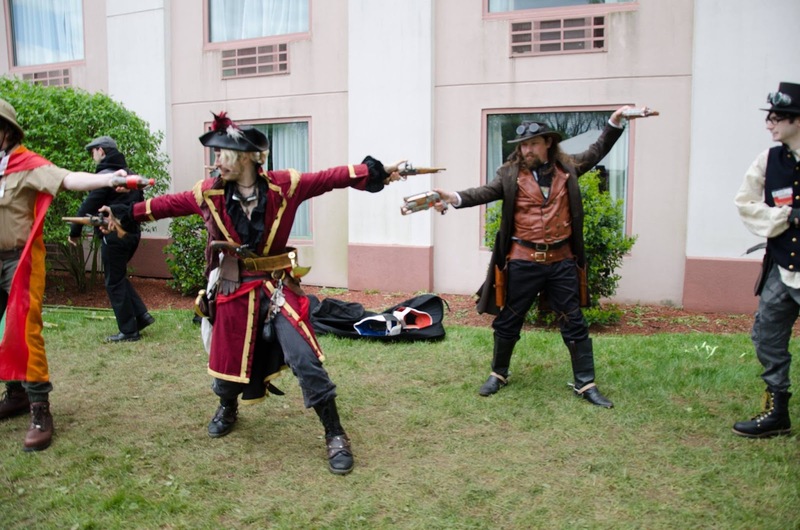 Nobody wanted Steampunk Worlds Fair to fail, so why did it fail? What they wanted was for Jeff Mach to be out of it, but they didn't understand that you couldn't transfer ownership of an event from a debt-loaded company to new operators 10 weeks before the event was to run. Even we didn't understand the full complexities. No one had ever attempted anything like this before. There is a scenario in which this could have turned out well for everyone: a form of negotiated settlement. If Jeff Mach had agreed to be bought out of his company before the great angry mobs of the Internet were brought into things. Of course, this would have required there to be two parties to form an agreement. The department heads of the company were speaking regularly and could have agreed to something, but who was there who could have negotiated for the other side? As it turns out, there was one person who was playing both sides to the middle and could have facilitated such an outcome: Elise Potenza. We later discovered that she had been orchestrating things in a significant way on both sides, either for vindictive purposes or as part of a play to take over the company, the details of which we'll discuss tomorrow. Elise was on the Consent Team in 2017 and was privy to all the personal allegations against Jeff Mach. She was in regular communication with the former staff who were working to see him brought low. She may have been feeding them information during the crisis in January, and she certainly leaked the confidential chat log which was the action which most directly led to the decision to step away from Steampunk Worlds Fair. She and her boyfriend Jakal Blackwell had also been on the Executive Committee in 2017, so were privy to a great deal of operational information and would have been able to leverage that perceived authority. On the Thursday one week prior to Wicked Faire, in January, she could have contacted all of the department heads to a meeting of vital importance. At that meeting, she would present the accusations which had been made public as well as any other information that she was able to share. She could then have presented anonymized versions of any other accusations she was privy to. Naturally, she could not include names or identifying details, but simply broad strokes to give us the picture. She might have also explained that she knew that strong forces were assembled to take down Wicked Faire if action was not taken. At that time, this meeting would have contained the same people that the actual department head chat contained. Most of that staff was there to do a job for the attendees. We wanted the events to continue, for the people to have a safe and fun event, and to go back to our lives on Monday having had a good weekend. How that happened wasn't terribly important. She could then have presented some kind of buyout plan. It could have taken any number of forms from a non-profit to a group forming an LLP. The purchase would have been funded by a fixed payment over time from the new company to Jeff Mach, similar to the agreement that was almost adopted in February. Fair, which will no longer be running. The response from the department heads, after some initial pushback and sharp questions, would probably have been, "OK, whatever, that's above my paygrade. See you next weekend." 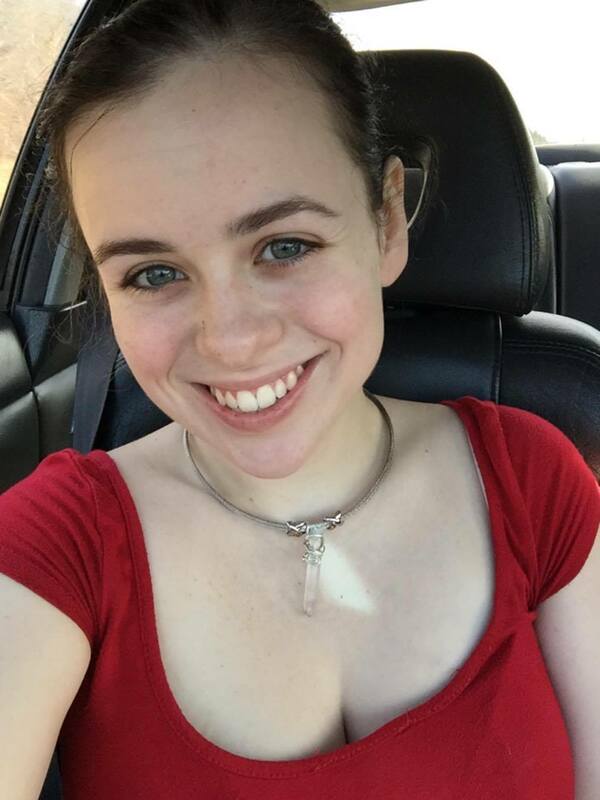 Elise could have then told her friends on the other side what was happening and gotten them to call off the attack dogs as the process wound slowly through the legal channels, allowing the events already on the schedule to continue successfully under transitioning management. Why would that have worked when we didn't listen to Elise when she assured us that she had some kind of evidence? In this alternate history, rather than saying more or less "I know something you don't know, so you need to trust me," she would have shared what she knew. Since Elise was on the Consent Team, it might be asked why we did not take her word that there were serious allegations and action needed to be taken. We didn't trust her because she was not trustworthy due to her past actions. She had used dubious information to remove a superior so she could be promoted into his former role. A couple years ago, Noah Smith was the highly competent and very effective Company Manager of Jeff Mach Events. There were some supplementary tasks that he was responsible for, such as human resources and other technical business duties which he didn't do a great job of, but that was Jeff's fault for giving Noah duties for which he was not qualified, rather than Noah's fault for not being able to do them. Noah did a fantastic job at something Jeff had never been able to do, leading the company in a way that led the staff to feel appreciated and like they were part of a well organized team. 1) She knew that Jeff Mach took consent violations very seriously and tended to give credence to the accuser over the accused regardless of evidence or lack thereof. 2) She knew that Noah Smith had seasonal depression and as the winter approached, his ability and desire to deal with stress diminished. Using this information, in the late fall Elise found charges against Noah. (I'll explain my choice of verb in a moment.) She brought these to Jeff with the suggestion that something should be done. Jeff approached Noah and told him that there were two allegations against him and asked what he'd like to do about them. Noah surprised Jeff (but not Elise) by saying that if he could get a small severance package, he'd resign quietly. Jeff was not trying to push Noah out and was quite surprised by his reaction. His intention was to investigate the allegations because he worked closely with Noah and the allegations didn't match his personal perceptions. 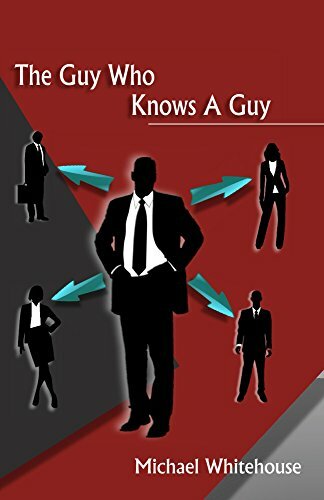 Noah believed that Jeff was taking advantage of his depression to push him out of the company with the threat of a scandal that he did not want to deal with. Noah left the company, believing that Jeff had maneuvered to push him out. Elise's name stayed out of it. Jeff lost a competent Company Manager. Numerous staffers followed Noah out of the company as he spread the story that Jeff had forced him out, and the seeds took root which would subsequently destroy the company. But for all the damage, Elise got what she wanted. She was promoted to "Manager on Duty", a job very similar to Company Manager, and a job she took over others who remained in the company with greater qualifications. redacted when she shared it with Brenna. 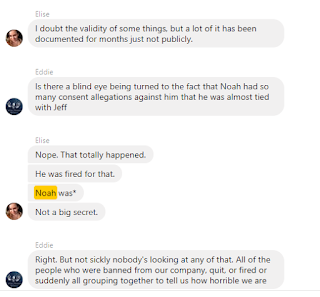 When I say "found" allegations, I do not know where they came from or if they were true, but I do know from something that happened a couple of weeks ago that Elise does not believe they were true. At Dark Side of the Con this past March, after she was fired from Security on Friday night, she decided that the four EMTs on staff were not sufficient and called in a friend to volunteer. That friend was Noah Smith, an individual that she had reported allegations of sexual misconduct against two years earlier. This means that she either knowingly brought a dangerous individual to an event in a staff role (for which she did not have the authority) or she knew that the allegations were false and she lied to Jeff two years earlier to rise in the organization. 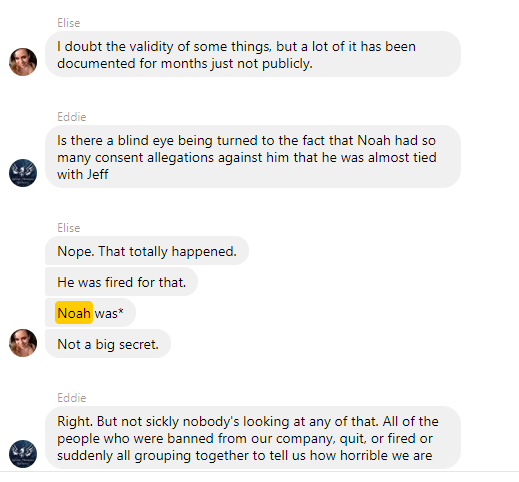 We did not know what would happen at Dark Side of the Con in January, but we did have our strong suspicions about what had happened to Noah and Elise's "allegations," which is why we refused to act on her word which we all considered quite dubious. There are many people involved in destroying this very popular event that we worked desperately to save, but there was one person who was in a position to offer a solution to save it who did not, and that person is Elise Potenza. What was her motivation in destroying the events rather than attempting to buy them? We can never know that. Maybe she lacked the sophistication to see such a solution. Maybe she wanted to let if fall apart so she could step in to create a new company to rebuild from the ruins. Maybe she just wanted to see the world burn. I leave such speculations to the reader. A Note about Dark Side of the Con: Many conventions do not have any medical staff present. If there is a medical event, they call 911 like anyone else. Almost no club nights have EMTs on staff. Jet, the owner of Dark Side of the Con, went above and beyond to have any EMTs present, and having 4 on Saturday night (5 with Noah) was exceptional. While the EMTs were kept busy, most of the issues they deal with at an event like that are people who have had a few too many drinks. Without EMS, Security would give them some water, sit with them a bit, and walk them back to their rooms to sleep it off. With an EMT present: they check their blood pressure, take a pulse, do a couple other quick checks, then give them a glass of water, walk them back to their room and let them sleep it off.